I was just showing you that like the nasty Veruca Salt, we all have that bad streak in us. (we are sinners) I suggested that you try to see your self centered point of view as “God views it”. While it IS selfish to go around wanting what you want and to throw tantrums when you don’t get what you want, that is not what is ultimately the cause of “me” focused living. The heart that pursues “me” living is one that does not seek God, and is not content with Him. The result of trying to do all that God commands will simply reveal that apart from His grace, you can’t do it. So why/how should anyone find contentment in God? Now, let’s take a quick tangent and discus needs versus wants. Things that I need are things I must have in order to live. Things I want are things that if I don’t have them I won’t die. Examples: Air=Need, T.V.=Want, Water=Need, Flying first class=Want…and so on. God describes our life as a vapor, and in all honesty, He doesn’t place as much importance on the human, fleshly existence as He does the Spiritual existence. In fact, from God’s perspective, the only thing that we truly “need” is found in the saving work of Jesus Christ in the cross. That said, God has already taken care of the greatest (only true) need we will ever have. Apart from Jesus, we are the ENEMIES of God. Sorry, but in any language, that is NOT GOOD. The wrath of God lives (abides) on our heads, except the fact that Jesus came as a spotless lamb to shed His own blood and restore our friendship with God! Now let’s stop and think for a moment…do you think it is either A. A want, or B. A Need to be counted a friend of the creator of the Universe, A.K.A. “God”? You know, the Sole Owner of eternity and the provider of the very air and energy it takes for you to breathe in and out?? Definitely a need in my estimation! Let’s look at some scriptures to get us excited about what God has given to us in Christ! 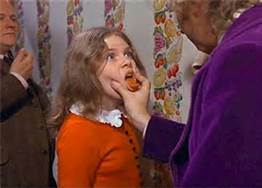 So, when we are a bad egg as we see in Veruca Salt, or as bad as OURSELVES-verse 7 puts it-“ungodly” and sinful people in need of a Savior, Jesus came and lived a perfect life and died a perfect death to reconcile us to God! The one that trusts what Jesus did is JUSTIFIED and SAVED from the WRATH of God! In this, we have all we need to be content. When those times come when we are angry or upset and want to pursue what we want, we can look at Jesus and know that no matter what, we have all we will ever need. If we can really grasp the magnitude of this fact, then we can lay aside all the silly earthly wants that drive us and instead be driven by the cross of Christ! This is something you can get excited about! So, take me, for example. I can get pretty nasty when I don’t get what I want. Shocking I know, but it shouldn’t be. I fall too. I have to stop myself and think about what I am going so after so hard, and does it really matter? To be right? To get people to agree with me? To_____? You fill in the blank for you. If my thoughts are right, then here is how I respond in my mind: “I cannot change people. Only God does that. I am not always right. God IS, however, always right. Look how he showed His love for me in His Son. Even though it doesn’t seem like I am going to end up getting things the way I want them; I know things will be what HE sees as best for me. I praise Him for knowing what is best and I accept what He gives.” That is how I battle myself, and that is how God wins. The Gospel ifs our life breath and frees us from the power of sin. Very well explained and illustrated, Christy. I'm sure this will bless many who read. Excellent examples 🙂 As I reflect on my day and see Veruca Salt all over it, this indeed drives me to the cross yet the more!